The kiss finally happened. It took forever and a day, but at least it came. Now can we get something going for Chil-sung that involves a bit of heart fluttering as well? We added ads! Ads help us pay for our server so we would appreciate it if you added us to your whitelist! We also established a criteria for dropping shows. It is at the bottom of this post. Check it out if you get a chance! SW and SP are looking at each other, she says this is like the day they wanted to ahve an affair. he suddenly kisses her, then he tells her that he likes her a lot more than Hyung, he can’t give her up. He is a bad person. So….just in case, you shouldn’t hate me anymore. He softly holds her head and kisses her. it is a small kiss. She looks at him afterward, and he looksa t her as they guage each others reactions. Then he pulls her into another kiss, a longer one this time. They stop kissing, and there is a moment of bashfulness. She hits his shirt and asks what they should do? Scene change to SJ and MD. She is teaching him how to cut with a knife. She is very hard on him so he wonders why she is doing this for (to) him. She just ignores that and shows him how to chop with the huge knife. Cut back to SW and SP. He tells her he likes her and she likes him but she is a bit agraid. he holds her hands and tells her not to be afraid, he will make it so she wont’ be afraid. From now on, he will love her more. He willnot run away. He will recieve all her calls and he will never make her hurt anymore. That is why he was hesitant, he couldn’t tell her until he was assured himself. their marrige was difficult right, lets remove it. SW – So we just love each other? He smiles and kisses her and they hug. Back at the Hungry Wok, SJ teaches MD different cutting techniques. For different produce, you have to use different parts of the knife. MD starts to cut an onion with one part of the knife. After he is done, SJ tells him that you have to use the front part of the knife for tiny produce. You must trust your left hand. For fire, the ladle trusts the wok. For a knife, the left hand trusts the right hand. MD starts cutting tiny produce. SJ tells him he is doing a good time and happily guides him. The little kitty cat watches from the window (this cat might be in homage to Way of The Dragon). CS comes up and happily greets Dimsum. he picks him up and asks him why he is not sleeping, does he also think a lot. It is a sleepless night, do you like milk? Would you like to drink with umma? he goes to get the cat some milk and runs into SP. CS makes himself a coffee which SP comments on, why drink coffee at this time of night? CS says he won’t sleep anyway. They both sit at the table. CS tries to bring up the chewing gum lady and thanks him for making her jajangmyun. SP asks him if it is difficult to call her Umma. CS never said that before. SP tries to coach him to say Umma. He says Umma over and over again. He says his parents also died early so he never said Umma, but he can say it because of CS. Dont’ save it, just say it many times for your Mom. CS tells him he is Umma for the tiny cat in front of The Hungry Wok. Sae-woo is the father. We are a couple. SW wants to raise the ca well together as a proper couple. SP tells him good job. CS tells SP that SW thinks her heart is empty. He was refused from her twice and stupidly still has feelings for her. It is like the experation date for canded food. His heart is open, but he should throw it away. SP tells him that the cats name is Dimsum, but he looks sad as he thinks about what he has to tell him. he is about to tell him but then MD comes in and settles in the kitchen. SP asks him if he is going home but MD says he is sleeping there tonight and pats him on the shoulder. CS asks SP if he had something to tell him? SP says it was nothing, he will go wash first. SW walks over a bridge and calls SP. He ansers while brushing his teeth. She wanted to call him so they can have their first phone call as a couple. He tells her he is in the bathroom, she jokes and asks him if he is naked. They laugh, SP lets her know that he is going to tell CS and wants to know if that is okay with her. She smiles and says it is okay. SP wakes up to the sound of MD snoring next to him. CS slept in the lazy boy couch all night. SP looks at him sleeping for a moment and then tries to quietly sneak out to go to the Hungry Wok. he starts prepping food. First he cooks almonds (cashews, peanuts?) and blends them into a liquid. He steams the liquid in a dimsum container and thinks about SW mentioning that she likes almonds. His eye looks like a tiny almond. He asked her if she liked tofu, he can make her fried tofu almonds. SW comes to work early because SW told her that he would make her almond tofu. She happily hops over the bridge on her way and greets SW with a bright smile. He feeds her a piece of almond tofu. She eats it happily and tells her that almond tofu tastes good. They take turns feeding each other. SW keeps cooking veggies for the almond tofu as SW says she must be the only woman eating fresh almond tofu. He pours the veggies over the tofu and continues feeding it to SW. She whispers something to him, like she will introduce him to someone or something like that. He says okay, but he looks at bit reserved. SS asks WCS if it is true that SR called the CEO of the hospital in order for them to get the 100 people reservation? BR looks up from her chopping station, interested in WCS’s response. WCS gets angry and tells him that they were originally their customers! they had this meeting there for more than 10 years! He angrily leaves. BR goes up to SS and asks him if they are doing a no show for SP’s restaurant, hey that was a fair competition. How can they do a “no show” that is just not good at all. SS asks whose side she is on. Most of our customers are from that hospital if they go there and see that his food is cheaper and better then we will have to quit our job, get real. BR sighs at the injustice. DS comes back wit everyone’s pay. It is cash this time because it is their first paychecks. CS says okay. Then DS wants to know if he is waiting for someone, he clears his throat and tells him that Omonim won’t come that way. CS sadl looks up the street for any sight of her. In the kitchen, one of the thugs says he took out so many shrimp intestines that he had a dream of shrimp taking out his intestines. Everyone starts to feed the customers that come in. There are regular customers who are here due to the shrimp festival. But it will be super daebak when the hospital gets here. SP pours one of the shrimp plates out and yells service. JH comes in to get a plate but she gets reprimanded because she misses all the critical moments of servine food and makes a lot of mistakes with the plates that have similar sauces. 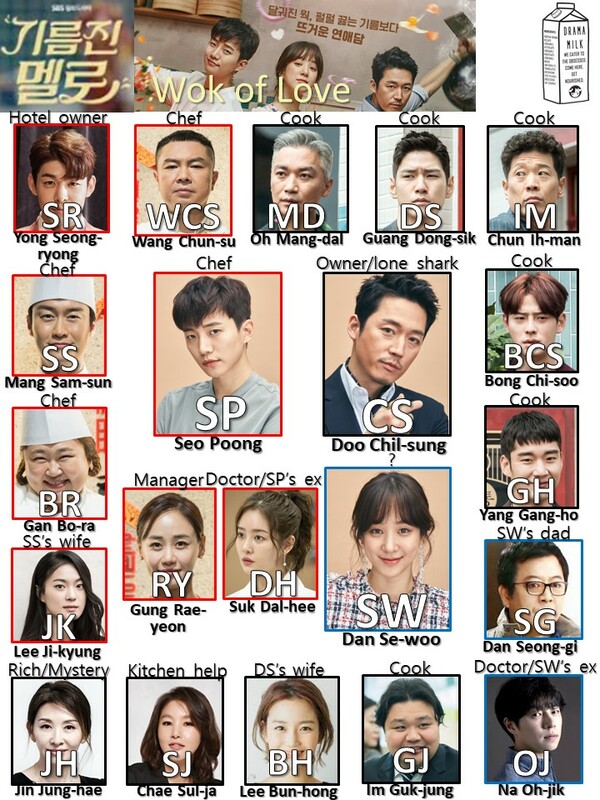 SP tells her that they are different and the kitchen is the same as the hall, he tells her that this dish goes to table 5 and keeps torturing JH about one table having troubles and how everyone will have issues. Don’t you see this? I didnt’ grant you this but you stopped dishwashing and went to serving. i thought it would be okay, but if you do not serve well then you need to come back to dishwashing. if you do not like the kitchen then you should leave. She asks if she is fired. he says he is telling her that she can be fired if she does not do a good job. All the kitchen people look on and try to intervene, but they can’t do anything about SP’s tirade. SP looks around for everyone, he wonders where they went without him. They went to subway, lol. The entire team eats their sndwhiches. JH is afraid that SP will show up in her dreams. GJ tells her that she was teh one that removed the gangpae image of their restaurant, how can he just pick on things that she doesnt’ do well? She tells them to stop talking about him, if reduces her appetite. At the hungry wok, SP answers a call from BR. SHe tells him, just in case, ….. ~. But we don’t know what she says. he tells her that he will check it. He calls the hospital and asks her if there is a possibility of canceling the order. The woman says that shouldnt happen, they are the ones that won the competition. SP says okay and hangs up. Everyone comes in afterwards with their subway cups. They don’t talk to SP. He gets the drift and goes to the kitchen. SW plays Switzerland in the matter as the person who is not on anyones side. She goes to the Kitchen SP tells her that it is hot, would she lik to get ice cream? She tells him that it is too loud, he would be quieter. She tells him not to smile because the people outside shouldn’t hear their conversation. This leads to a lot of “don’t smile!” back and forths. The people outside think they are in a tiny bickering style fight. Do they like each other? JH tries to eavesdrops on their talk. SW tells SP not to smile, he wonders why he shouldn’t. But SW doesn’t tell him why. Later on, SJ and JH pull SW to the freezer and asks her if SP likes her, why shouldn’t he smile at you? SW is all like, humans can smile to humans. Umma asks her if he is married, right? She tells her that he is divorced. Umma is concerned and does not want SW to date him, she should meet a person that matches her social class. SW says she dos not like him, he doesn’t even think she is a woman. Umma says that she does not like him, he has no house, he sleeps there in the restaurant, never ever date someone like him. He also doesn’t say nice things. How dare he. SP walks into the room and all the ladies scream. He wonders what they are doing. One of them says that they were about to go out. SP tells them that he can take this out, he grabs something and pulls it away. After work, SJ, SW, and JH leave to go home. JH pulls her daughter away. SJ smiles at SP and tells him to go home early since they have a big day tomorrow. The mansion team heads home. GJ wonders if they should take a taxi as they all wait for the bus. GJ thinks it might be cheaper to catch a taxi than the bus. The light changes so they walk across and calculate the price. SP runs up and pulls SW away with a smile. No one notices. SP asks her if they ae taking the bus together? Then he pulls her away to have fun. Meanwhile, CS walks up a street as he looks at an address in his hands. Cut to inside one of the buildings. Umma is eating ramen alone when the door opens. CS comes in and looks around at the tiny house. Umma asks him if he wants some ramen? CS looks at the boxer poster of his appa, it looks exactly like CS (OMG why is he posing like that). Umma tells CS that he is his real abogi, he adored CS so much. Flashback to CS walking out of a match all bloody and broken. But he is the champion. Umma runs up to him with the baby. He tells her to stay home, she jut gave birth. She was concerned though so she came. CS smiles and they box look at their son. He tells them that he will protect them both forever. He kisses the baby and blood drops. then CS passes out. He might be dying on the spot. he reaches out his hands to touch his baby and dies. ( I don’t know if this should be comical or not, the scene could go both ways). CS is affected by the story. Umma tells him that she does not hav anything to give him so he can leave. CS sits and says that he wants to be raised by his mother for once in his life. So just raise him now. He starts to eat the ramen as his mother stares at him. She sits and watches him as he eats. SW and SP think about what to drink. SP does not want to drink so he can take her home, but he wants her to drink. She is all like, it is not like a man should take a woman home. But he says it is fun to take the woman he likes home. She wonders if she should go home today? She can sleep outside. he tells her that she always says that. She asys he is not meeting a younger woman, when she was in college she was so mature, younger people respected her, she never dated a younger man. Her mom calls but she flips the cell phone. He tells her that seh is older than him but it isn’t even 9 yet your mother is calling? She says she used to listen to her mother well, but maybe she will not listen to her anymore. Her mother doesn’t listen to her anyway. SP wonders what nonsense that it. She changes the subject and tells him that he looks cute when he smiles. They start to talk about the kitchen, he thinks she looks closer to the kitchen staff that him. She asks him if he is jealous. He leans in and says, yes, he is jealous. She tells him that they shuold date but no one should know about the dating. He doesn’t want to. She thinks it is more exciting to date secretly. But he doesn’t do those things. They laugh about it for a minute. He tells her that he will not secretly date. He just wants to date openly. Why should they hide, are they sinners? She stands up and says that seh will go home, she feels like her head with burst. he tells her to sit and he agrees to do it secretly. She starts to smile and say she will treat him well secretly. She gives him a sip of alcohol that he reluctantly drinks. He wants to know what she will do with a drunk him. She tells him not to mistaken it, she just wants to have him without anyone else knowing about it. SR tells WCS that he talked to the owner of the hospital, so prepare the dinner as planned. WCS tells him that he will prepare for 100 people. he goes into the kitchen with his evil smile and looks over his staff working hard. BR asks him if something good happened? SP makes CS a milk smoothie of some sort with a tiny hand held blender. he gives it to him to drink and also drinks some himself. Then he tells him that he has to tell him something. CS asks what, are you talking bout the salary? Don’t worry, I will give it to them before the group comes. Outside the Hungry Wok, SW happily puts a sign on the door that says they are not open due to a private meal they are serving today. Inside, everyone works hard to prepare. But then JH runs in and tells SP there is a phone call about the reservation. The woman from the hospital calls and says they have to cancel the group dinner. SP asks the reason. She says the owner of the hospital says that they get a lot of donations from giant hotel so they need to eat at the hotel. The owner decided this and is also attending. SP understands and tells her to please give them a chance next time. CS asks what happened, they canceled the appointment? No show? There are only two hous left, why dont’ they have any manners, we have so much food, what should we do? SP walks off to a back room and tries to contain his anger. CS goes in and tells him to make ten jajangmyuns and ten changsuyuks, he will deliver it to the hotel. SP wants to know what he will do, fight with it? CS says he willd eliver it. SP says they cant deliver it. CS lets them know that they have no show due to the hotel, they pocked the owner of the hospital and screwed their business, that is not fair, why should we be the only victims? He will deliver the food to a very improtant customer for him, they do not meet because he is a gangpae. But he has to see them. SP tells him that he will go also, he knows the hotel better. the problem is that everyone knows CS and SP in the hotel. They will need to deliver is quickly though before it gets soggy. CS tells him that the hungriest people in the hotel will enjoy his food the most, so make nice jajangmyun. SP agrees. SS tells the hopsital people that their jajangmyun tastes better if you eat it with salmon. The hospital people start to eat. In a pricate room in the back, the owner of the hospital sits to eat with all the other VIP hospital people. The nurse is not happy to be there. SR comes in and greets the hospital owner. He tells him he is selling his 70 dollar course for 18 dollars, he is losing a lot of money. SR and WCS laugh and says that they will do it for their VIP. The nurse rolls her eyes. Meanwhile, MD and DS show up at the hotel with a cowboy-ified CS. They go into the room where the construction protest is. CS introduces himself as the thug Doo Chil-sung who called them. they will not see him so he came there to see them. The contruction workers tell them that they hate gangpaes, leave gangpaes! But CS just tells them to listen up, they are hungry right? I brought the best jajangmyun and changsuyuk in the world. MD and DS start to unpack the food. It smells good right? I know how these guys are torturing you and not letting you eat. I brought this food for you. They think he is lying though, how can he deliver food to them? CS tells them to try it first. Everyone tries it and immediately starts to gobble it all up. CS even eats as well. he asks them how they like it, it tastes good right? MD tells them that those doctors couldnt’ eve try this delicious jajangmyun. Back at the Hungry Wok, everyone mopes around at the empty place. SW holds SP’s hand as they look at it. With the construction workers, CS happily eats and drinks with the construction workers. the head worker says that his kids should enjoy jajangmyun and changsuyuk, why don’t they give him the money. CS listens to them. Time is up for them to give them money, if they don’t give them money, then they will protest and publicly embarrass them. CS asks if he can sell the right to protest. He will buy it and pay him. This bad hotel guys, gangpaes like him should take care of them. Let’s drink. The food comes out. The hospital owner eats it and nods, he likes it even though it is different. But the nurse says that jajangmyun should be like jajangmyun and sighs. At the hungry wok, SJ tells them that they got their salary even though they did not have their customers. At the hotel, SP meets the nurse outside the hotel. He politely asks her where the owner is. She asks him if he is there to protest, he says no. She shows him the owner who is coming out right now and asking where they should go next. SP goes to him and asks him if he would like to come to his place to drink afterwards? Meanwhile, CS and MD and DS clean up all the empty plates. DS says that Poong would like this a lot, he likes empty plates. Elsewhere, the team goes shopping at a Sephora like makeup place. they want to enjoy their paycheck a little bit. Jh puts makeup on her daughter and tells her she is so pretty, seh used to be that pretty. At the Hungry Wok, the owner of the hospital is there. SP is cooking for him and only him. He makes a very fancy sampler jajangmyun along with changsuyuk and a cocktail. he sets it all out for the owner. The plate looks gorgeous with different colored noodles in tiny cirlces around the plate in a circle. the owners eyes grow wide, but he thinks he is too full to eat. SP tells him to try it with the cocktail, he made it to go together. the owner tries it and licks his lips in enjoyment. he looks as if he can’t believe how good it tastes, but he doesnt’ say anything and continues to eat quietly as Sp watches him. then he tells him that he enjoyed his food and leaves. I think he only had one bite and one sip and then left. But he paid 100k won ($100 USD). SP goes outside and sits on the bench. SW comes back and sits with him. He ask her why she is back. She jokes and says she wanted to. She also bought some things secretly. He tells her she looks like a noona that has secrets. he also noticed that she has makeup on. She asks him he is okay. He says he is. Rich human or poor human, it is the same. They should have their response tomorrow. But then he sighs and tells her that she shouldnt’ have come. Becasue I am not confident secretly dating. He leans in and tells her that he is not confident. She also leans in and says they should do it. He pecks her. She asks him if they ae doing it? he tells her that he does not do secret dating. He smiles as she says, if he does not do it then seh will kill him. CS sees them (of course, they are right in front of their building). Wok of Love is removing two thirty minute episodes so the show will wrap at 38 episodes. Update, @netizendrama just let us know that the last episode will be on July 17th. Also, I just had to shake my head at Sae-woo talking all that mess about secretly dating and yet making out right in front of the hotel. Can’t they go make out somewhere else? SJ – OJ came back. SW – I am sorry but I will go outside for a little bit. Thug – You touched something that you shouldn’t have touched. Appa – Why do you want to see me? CS – Tell me his name. Oh, the nurse would be great! Oh no, does he still not have a love interest yet? Thank you for letting me know!